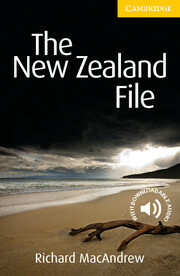 Called away suddenly to a secret meeting in New Zealand, British spy Ian Munro senses that he is being followed. Who's following him? And why is the coded information he is given so secret that others are prepared to kill for it? Can Munro escape and crack the code? Paperback-only version. Also available with Audio CD including complete text recordings from the book. This award-winning graded readers series is full of original fiction, adapted fiction and factbooks especially written for teenagers.